"A silk Persian rug is easy to distinguish by its brilliance and unparalleled luminosity. This luxurious fiber fueled global economies and led to the establishment of ancient trade routes. The silk Persian carpet has the unique ability to catch and reflect available light, which gives the fibers and colorful patterns a saturated yet translucent appearance. A silk Persian rug is not only luxuriously smooth and soft, the thin protein-based fibers provide exceptional strength and durability. 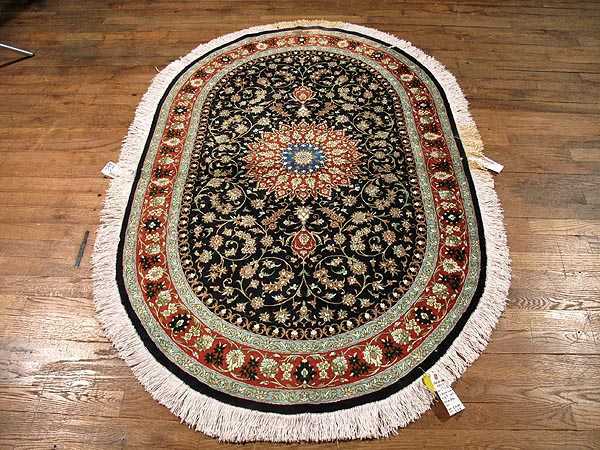 A genuine silk Persian carpet provides an unmatched look and feel that is worthy of royalty."